Do you love assisting people through online chat? Do you prefer customer service over sales? Do you have great communication skills? Check out the companies listed below for online chat jobs and make sure to check back for new listings. You can always search for more part-time and full-time jobs with one of my favorite websites, FlexJobs.com. The company guarantees that every single job is 100% legitimate. This company hires Chat Support Agents to handle consultant sales and recommend product features to customers. Talk 2 Rep pays a base rate of $9 to $14 for every hour. Apple has a call center program that hires persons including college students to work from home on a full-time or part-time basis. Chat Agents must reside within 100 miles of certain locations. Check the Apple site for more details. As an expert Chat Agent, you may be selling services, increasing leads and achieving customer satisfaction via live chat. The pay is $10 per hour. To work for this company as a home-based Virtual Chat Agent you must be able to type 60 wpm and have a reliable computer. Payment is a $10 per hour. The Arise Platform provides work from home customer support opportunities to call center companies and their agents. Provide support to F500 companies and set your own schedule. The revenue ranges from $9 – $14 per hour. Chat and answer questions that you have expertise in and get paid. Occasionally hires Chat Support Agents to provide technical support in the following areas: US, Hawaii, Puerto Rico, and California. Needle – This company strictly hires online chat Customer Support Agents to assist customers with online shopping. Payment is per chat with flexible scheduling. Occasionally hires Chat/Email Support Agents better known as a “Customer Success Advocate”. This home company offers jobs in different positions such as inbound/outbound customer service, live online chat or email response. Payment is around $8 per hour with incentives. Occasionally hires chat support agents to work from home. Check their careers page for future openings. Looking For More Companies That Recruit Work at Home Chat Agents? If so, I recommend checking out FlexJobs. This is a membership site with tons of hand-screened job leads from reputable companies. You can go here to see which work at home chat jobs FlexJobs has up right now. Want more videos? Subscribe to my YouTube channel for more work at home job leads. Thank you for the information. Most of these jobs are in the US. Can you make a video or provide resources of WFH jobs for those in Ontario, Canada? Most of these are Work at Home Jobs for US based perssonnel, but what if we live in Canada? It would be nice to have a blog post regarding online jobs that accept people from other places as well. Thanks for the info though..
Lashay: thank you so much for helping us with finding work at home jobs! Lashay- Would you have any idea how I could apply for capital typing? I’ve went on their page many times looking for something and can’t find anything that deals with employment. I am interested in working at home. I just graduated from college with a degree in healthcare management and I have yet to find a work. I am currently working but my daughters pregnant and I want to stay home with my grandchild when he or she gets here. Looking for a legitimate work from home job that doesn’t require being on the telephone. Now let’s see a list of those online-chat jobs that don’t do background or reference checks. Hey, Kim! 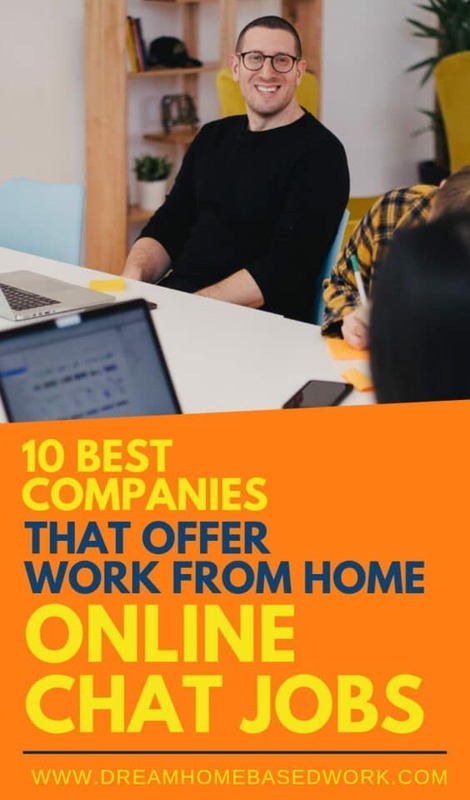 I would suggest out these part-time jobs listed here https://www.dreamhomebasedwork.com/part-time-work-at-home-jobs/. Hope this is a start! Hey Lashay, I unable to find any chat or Email support work in India, could you please help me to find the same. Hi Toyia! The Chat Shop will except an updated resume. Good luck! I’m ready to work at home , my passion is call centers but I’ve never worked in one I enjoy talking to people and solving problems . What are some first time jobs/ little to no experience that you recommend in the at home field ? Hi! Great 🙂 I would recommend companies like Liveops and Nexus OP. Hello! I have worked online through Leapforce and Appen and am now looking for more work at home opportunities. I type around 50 WPM, am soon to be a college student, and am very organized and a hard worker. Hi I leave outside the US. I live in St.Lucia which is in the Caribbean. I am interested in live chat, email support and call center type of jobs. What would you recommend for me? Hi Lashay, I’m currently a stay at home mom of five. This has been my gig for almost 11yrs now, I love my kids but I am ready to make my own money for multiple reasons…it was my husbands idea that I stay home but now it’s constantly thrown in my face that I don’t contribute to anything because I don’t work and I’m tired of asking for my allowance…another reason is, I will soon be a single mother of five kids and need to be able to make it on my own. My youngest starts kindergarten this fall as I would love to have as much time with the next few months as I did with her brothers and sister. (before she goes to kindergarten and I blink and she’s a snotty 14yr old that thinks I’m the dumbest person to walk the planet lol) I would love to do some kind of data entry, inbound customer service, or virtual assistant job but I’m willing to do anything at this point! Jennifer, I’m sorta in the same boat as you. I was wondering if you had any success finding work from home???? Hello Lashay, I have recently lost employment and have a strong background in administration and customer service. Do you have any suggestions for a home based job that might suite me? Hi Damion! Thanks for reaching out. You would definitely have what it takes to land a job with Apple. I advise applying on their official site http://www.apple.com/jobs/us/aha.html . Im new to this work from home community. Im pretty bored with much of the office politics and working amongst people. I would like to give home based work a shot and see if working in solitude would be better for me. I have only one concern about these work from home jobs. That is the one of taxes. Most of these jobs require that you pay your own taxes… Do you have any information on this? Hi Lashay, I’m a working mom before. But now can you help me to find a work even at home. I need to find work because my daughter has a congenital heart disease..
Hi Lashay, I’m currently looking for a legit data entry job at home or a chat agent. Nothing with phone. I recently worked for best buy at home and that was inbound calls. I have 3 kids so i need something i don’t need a phone for. Please help! Thanks! Hi Lashay. I’m a stay at home mom as well. My family has recently hit some hard times and with the high cost of child care, I still have no option but to stay home. I have applied for some captioning and transcribing jobs, as well as a call center job but to no avail. Is there any help you can give me? It would be greatly appreciated to at least have a step in the right direction. I’m a great typist, with great communication skills. I cannot take a job on the phone as I have 2 toddlers around most of the day, (one is in pre-k for 3 hrs a day). Again, any help would be greatly appreciated. Hi Jackie! Thanks for stopping by. With your typing background I suggest companies such as Rev, Transcribe Me, Scribie, and Dion DATA Solutions. Thanks Lashay! I was not accepted at Rev, but I will definitely look into the others and give them a try. Hi Lashay I watched many of your videos. and yes I research many online jobs, and had no luck lately. is there any way you can get me started because most jobs I tried said they would pay and there scams. when they charge you it usually means scam. Hello Ms. Lashay, I’m Linda from Philippines. I saw this site through searching. I just want to ask how to apply for a homebase work here? I have experience in Researching, Data Entry, Transcribing and I want to try Chat/Email support, too. Hoping for your reply. Thank you. It seems that Capital Typing has changed their site and no longer has a chat position available. I have removed the company for now. , how do you apply for capital typing? Hey Regina! It seems that Capital Typing has changed their site and no longer has a chat position available. I have removed the company for now. any legitimate chat/email jobs out there that are hiring for work at home agent in maryland? Hi how can I submit my application for the above companies? I went to their website and I can’t seem to find, where to submit application. Hi! Which site are you referring to? i too cannotfind chat who is handling all of them?? MOre people use chat nowadays i dont understand why its so hard to find a job doing it. hi. I am also looking for online chat support agent. Hi! Did you apply to one of the companies above? Those are the few sites that hire online chat agents. Hi! I recommended checking out this article for international job options https://www.dreamhomebasedwork.com/international-work-at-home-jobs/. Currently Arise only has phone jobs. You have any advice for a person just starting out working at home looking for a non phone. I been applying everywhere with no luck yet, help? I will take a look again, thanks. Needle is actually pay per chat… Not hourly unfortunately. Hi Lashay! I wanted to know are there any chat agencies where you dont have to be an independent contractor? The only one I’m aware of is Talk 2 Rep.
How do you apply with Talk 2 Rep? Once you visit the link, click on ” Career Opportunities”. Then select ” Virtual Work at Home…” from the Location dropdown box. Please let me know if you are still having trouble. It takes forever to get a job with Needle. I signed up two years ago, and they still don’t have any jobs available. Hi Lashay! I am new here in this website. Is there any offline typing jobs out here or online typing jobs that earns $2.5 per hour? I badly need a full time job but at least its home based. I am from Philippines, and it’s pretty hard for me to get a home based job. I only have 3 months of experience on BPO Call Center. Hello Lashay im trying to apply to televated but cant find an application or information on where to apply or send resume… Can you help me with this? Under Armour, Skull Candy, Finish Line, etc. Hello Lashay i am new here in dreamhomebasework.com, i would like to work at home. Thanks your help is highly appreciated…. Hi Erwin! Thanks for getting in touch. How can I help you? Hello Glad to hear from you..i would like to work online at home…How can i do that lashay….Thanks again really needs your help…. Hey! Yes it really depends on the type of job you are looking for, What type of work experience do you have? I prefer to work as Data Entry. I worked as Office clerk in my Previous career of a Publishing company but somehow i work also in a data entry for a quiet sometime home based. Ok. I would suggest looking into these legitimate data entry jobs https://www.dreamhomebasedwork.com/online-data-entry-jobs-2//. To apply, you would visit their official site by clicking on the company name. You’re welcome Erwin! let me know if you have more questions! Hi I just subscribed to this site and I wondered if anyone here knows what tab to click on at the Apples website in order to apply for a job there. I sometimes find it difficult to see where on any or these work from home websites have a tab to click on in order to apply. Many are easy to find but some make it difficult. Hey Lily! It seems they they have changed the look of their site. When you click on the link above, scroll down the page until you see “Apply in your location”. Then you will land on the careers page, scroll down and find the “At Home Advisor” listing by location. Let me know if you are still having trouble. Hi, my name is Jaime I am from Scranton, PA. I am looking for a work at home non phone job. I have MS(Multiple Sclerosis) and I have been receiving SSI monthly… its not enough to help. I have a child that needs more than I can afford on my monthly income. I was looking for a non phone job for that reason, so that I can keep an eye on him plus get my work done. I have been looking everywhere, I want to make money from home. Can anyone help me???? Do they require some experience or does it vary? It really depends on the company. For example Talk 2 Rep requires you to type a minimum of 60 wpm with chat experience. When you click on the company name, most of them will specify any requirements that you to have. For most, at least some type of chat or customer service experience. Hi Lashay, Currently working from home as a Brand Ambassador, looking for something a little different. Something along the lines of a chat customer service rep would be great. Any ideas on what a good company to do this with? Any advise would be appreciated. Hi Karen! I have heard many good things about Apple and Talk 2 Rep. The great thing about Apple is they actually provide you with a MACbook to the work. Also both companies have offers employee benefits! I am a senior citizen, retired, and money is of the utmost importance. I would like to do surveys because I think I would be of use. I owned my own women’s clothing store for over 25 years but I cannot work on the outside because my husband has the onset of ahltzeimers. Hope you can help me. Hi April! For legitimate survey companies, I recommend checking out sites like Pinecone Research, Ipsos Panel, Toluna, Survey Savvy, Global Test market,etc. Hope this helps! This is very helpful I am currently working from home for Asurion and it is a plus minus company to work for. So you videos and links are a blessing with helping me in my job search. Hi John! For G5 Live, this company is no longer operating so I will be removing this link. Thanks for the heads up! Ok Thanks! It seems they are not offering work at home positions at this time. Hi Lashay, are there any companies which will hire UK based people for online chat work? Hi Julia! As far as online chat jobs, unfortunately there is not a company that I would recommend for the UK. If I do come across an opportunity I would post it here – https://www.dreamhomebasedwork.com/global-work-at-home-job-leads.html/. Hi Mohand! As far as online chat jobs, unfortunately there is not a company that I would recommend for the UK. If I do come across an opportunity I would post it here – https://www.dreamhomebasedwork.com/global-work-at-home-job-leads.html/. Hey Lashay thank you once again for this very valuable info! Lashay you are such a intelligent, kind, and beautiful woman I wish you much continued success in all of your endeavors may God continue to bless you richly!! Hi Reginald! Thank you so much 🙂 Blessings to you as well! Hi! Thanks for writing in. It can be difficult depending on what type of job you were interested in. I would recommend taking on a clerical job as a Virtual Assistant https://www.dreamhomebasedwork.com/virtual-assistants-2/ or a job that doesn’t involve being on the phone. Hi Daryle! That is awesome. I would advise taking at these companies I posted here https://www.dreamhomebasedwork.com/esl-tutoring-jobs/. The offer ESL tutoring jobs from home. Hope this helps! There are a few companies that will work at home jobs in India. I would usually post them here – https://www.dreamhomebasedwork.com/global-work-at-home-job-leads.html when I find them. Hope this helps! Hello, can you please help me find jobs. My husband works but it’s not enough to cover the bills and a small child. Hello! Thanks for writing in. What type of job experience do you have? Then I can recommend some companies for you ..
Hello is this also available in Philippines? thank you. Hi, Thanks for writing in. Unfortunately there are not many chat jobs I come across for India. But when I do, I would post them here – https://www.dreamhomebasedwork.com/global-work-at-home-job-leads.html. Hope this helps! Hi, did you need help with one of the companies? Great Links. And need this job too. My wife and I are trying to look for jobs. Thanks! Best wishes to you and your wife!